OKF Coconut Drink is made with natural ingredients, inc. coconut pulp. Coconut palm tree fruit is full of nutritional benefits, including high fiber, lots of potassium, and loads of vitamins and minerals. With no preservatives and no artificial colors or flavors, OKF Coconut Drink is the #1 coconut beverage that tastes great and is good for you. And just to titillate your taste buds, we carry a variety of flavors, including Mango, Pineapple, and Strawberry — and we have the original OKF Aloe Vera King beverages too! 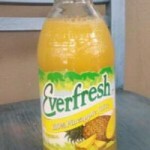 This coconut drink infused with pineapple…..is awesome! Serving size: 8 fl oz (240ml). Servings per container: about 2. Calories 66. Total Fat 0g. Sodium 15mg. Total Carbs 21g (Sugars 18g). Protein 0g. OKF Coconut Drink Pineapple…..great stuff!